SteamOS Beta is already out and running. Many PC gamers have already downloaded and started tinkering and messing with first true gaming operating system for the PC. Valve has designed SteamOS specially for the Steam Machines, an upcoming lineup of PC-type living room gaming consoles that would be manufactured by various custom PC manufacturers and Valve itself. To complete the living room gaming experience, Valve would also soon release Steam controller, a revolutionary gaming controller that comes with trackpads in place of thumb sticks. 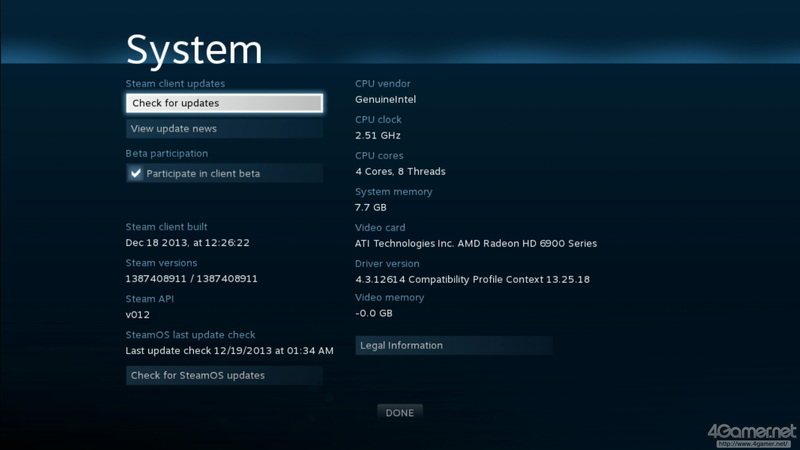 However for now, Valve’s SteamOS does not support any GPU other than NVIDIA. Here is what happens when you run the SteamOS on AMD graphics card. AMD is not supported by SteamOS for now, but some people have still tried to check what happens when you run SteamOS with an AMD graphics card. The card used in the test is AMD Radeon HD 6950. SteamOS booted up quite normally with the AMD card, and operating system ran smoothly without any lags. However when checking the system specification, SteamOS displayed 0.0 video memory, though it recognized AMD Redeon HD 6950 under the video card. This means you can run your SteamOS on AMD video card but you will not be able to play any games or do any heavy work that requires graphics memory. The thing we dont get is that even running Steam OS would require at least a little bit of memory, so theoretically even SteamOS should not have run. The recognition also leads to positive thought that Valve will announce AMD support soon in future versions of the operating system. SteamOS is still in its beta stage, there is a possibility that Valve will release the original version of SteamOS that would support other video cards as well in near 2014.